Sent With a Tracking No. 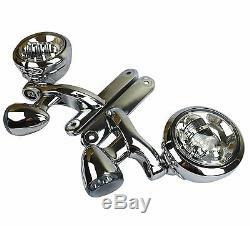 Auxiliary Turn Signal Spot Fog Light Bracket For Harley Street Glide Road King Chrome. 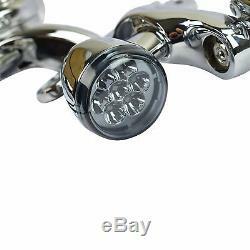 Chrome LED 4.5 Passing / Auxiliary Light kit Compete With bracket and LED Amber Turn lights. Installation : Must use old hardwire and use old mounting Nuts. No Harness included must hard wire. Shell Material : Diecasting aluminum alloy housing. Color : Chrome&###xA0; LED 4.5, Chrome Brackets, Smoked Lens and amber Turn lights. Lumen : 1450lm per 4.5 LED&###xA0; light 2900 Lumens Total. High-performance drop-in replacement or addition that retrofits stock harley fog lights upgrade your old bike with this new Custom Design. Unique look & outstanding lighting&##xA0. Waterproof & Weatherproof and&###xA0; Rustproof. Rugged solid state LEDs can withstand shock & vibration. Die-cast aluminum housing provides maximum protection. Does not fit Road Glide models. 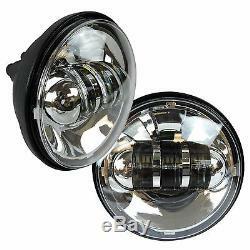 1 Pair 4.5 LED Fog Light W/ Housing Bucket. 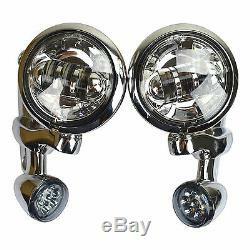 1 Pair LED Turn Signal Lights. 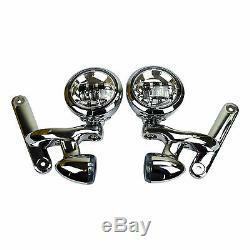 1 Pair Auxiliary Lighting Brackets. Any product you return must be in the same condition you received it and in the original packaging. 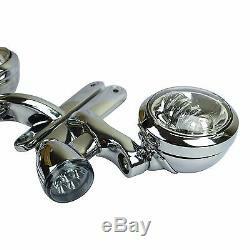 The item "Auxiliary Turn Signal Spot Fog Light Bracket For Harley Street Glide Road King C" is in sale since Tuesday, February 19, 2019. 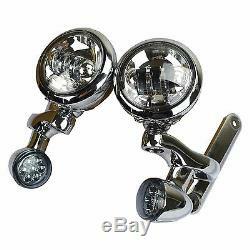 This item is in the category "eBay Motors\Parts & Accessories\Motorcycle Parts\Lighting & Indicators\Fog Light Assemblies". The seller is "mf-distribution" and is located in Bakersfield, California. This item can be shipped to United States, Canada, United Kingdom, Australia, Mexico, Germany, Japan, Denmark, Romania, Slovakia, Bulgaria, Czech republic, Finland, Hungary, Latvia, Lithuania, Malta, Estonia, Greece, Portugal, Cyprus, Slovenia, China, Sweden, South Korea, Indonesia, Taiwan, South africa, Thailand, Belgium, France, Hong Kong, Ireland, Netherlands, Poland, Spain, Italy, Austria, Bahamas, Israel, New Zealand, Philippines, Singapore, Switzerland, Norway, Saudi arabia, Ukraine, United arab emirates, Qatar, Kuwait, Bahrain, Croatia, Malaysia, Brazil, Chile, Colombia, Costa rica, Dominican republic, Panama, Trinidad and tobago, Guatemala, El salvador, Honduras, Jamaica, Viet nam.